Bravo Niagara!’s fifth season will bring the world’s leading classical and jazz artists to the Niagara Region. The new season launches October 12, 2018 as Bravo Niagara! welcomes back Grammy and 11-time JUNO Award-winning violinist James Ehnes and acclaimed pianist Andrew Armstrong. Hailed as “a violinist in a class of his own” (The Times), Ehnes will perform an intimate recital featuring a program of Beethoven, Ravel, Brahms, and Corigliano at the historic 1792 St. Mark’s Anglican Church in Niagara-on-the-Lake. James Ehnes has established himself as one of the foremost violinists of his generation. Gifted with a rare combination of stunning virtuosity, serene lyricism and an unfaltering musicality, Ehnes is a favourite guest of many of the world’s most respected conductors including Ashkenazy, Alsop, Sir Andrew Davis, Denève, Dutoit, Elder, Ivan Fischer, Gardner, Paavo Järvi, Noseda, Robertson and Runnicles. Ehnes’s long list of orchestras includes, amongst others, the Boston, Chicago, Cleveland, Philadelphia, Los Angeles, Pittsburgh, New York, London Symphony, Philharmonia, BBC Philharmonic, Czech Philharmonic, DSO Berlin and the NHK Symphony orchestras. Ehnes is a Fellow of the Royal Society of Canada and in 2010 was appointed a Member of the Order of Canada. He plays the “Marsick” Stradivarius of 1715. On November 3, 2018, Bravo Niagara! presents the Voices of Freedom Concert curated by artistic producer Céline Peterson, daughter of the late jazz legend Oscar Peterson, at the FirstOntario Performing Arts Centre’s Partridge Hall in St. Catharines. The Voices of Freedom Concert will bring together some of the best in Canadian jazz and soulful music to highlight inclusiveness, empowerment, and the importance of freedom. The concert will feature performances by Officer of the Order of Canada, singer/songwriter and philanthropist Molly Johnson, NAACP Image Award, Gemini, Dora and JUNO Award-winning singer/actress Jackie Richardson, Grammy Award-winning Larnell Lewis on drums (Snarky Puppy), multi-JUNO Award winners Robi Botos on piano and Mike Downes on bass, up and coming saxophonist from Barbados Joseph Callender, and the Laura Secord Secondary School Concert Choir. The season continues in 2019 with the second edition of the Oscar Peterson International Jazz Festival from February 15-17. 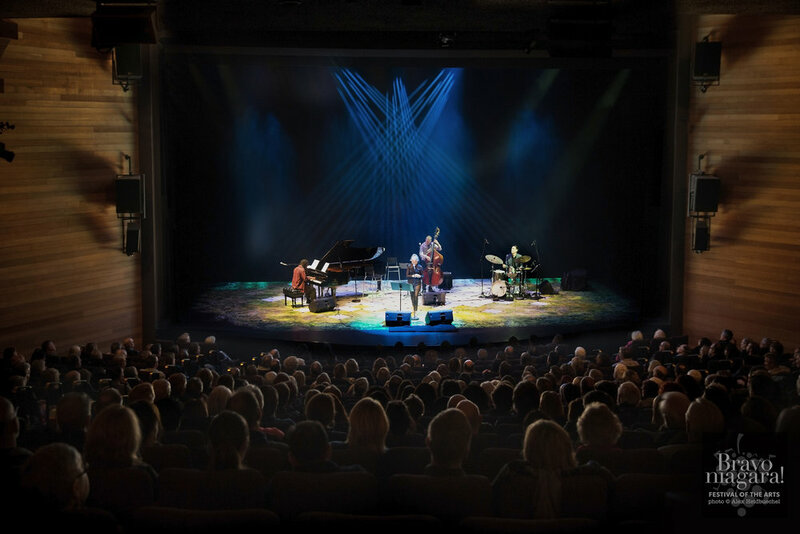 Led by artistic director Renee Rosnes, artistic producer Kelly Peterson, and executive producers Christine Mori and Alexis Spieldenner of Bravo Niagara!, the inaugural Oscar Peterson International Jazz Festival in 2018 brought “true jazz to Ontario… evoking jazz’s golden afterglow of the 1960s and early 70s” (The Globe and Mail). The second edition of this festival promises another exciting weekend of true, swinging jazz in picturesque Niagara wine country. The artist lineup will be announced in November 2018. From April to May 2019, Bravo Niagara! will celebrate its 6th Annual Spring into Music Series with internationally-acclaimed jazz and classical artists, as well as rising young stars. Jamie Parker and The New Gen (May 12), a unique project that pairs two of Canada’s rising classical musicians with renowned pianist Jamie Parker. The series finale features the inaugural Gala Concert for Piano Six: Next Generation (May 25) at St. Mark’s Anglican Church in Niagara-on-the-Lake. Modeled after the original “Piano Six” group including Janina Fialkowska, Angela Cheng, Marc-André Hamelin, Angela Hewitt, André Laplante, and Jon Kimura Parker. Piano Six: Next Generation features a collective of six internationally-renowned Canadian concert pianists: Marika Bournaki, David Jalbert, Angela Park, Ian Parker, Anastasia Rizikov, and Daniel Wnukowski. For tickets, visit http://bravoniagara.org/tickets/ or call (289) 868-9177. Prices range from $30 to $80. ‘Under 30’ ticket discounts available for ages up to 29. Prices exclude HST and service fees. Bravo Flex Passes available by phone only. Purchase 3 concerts or more and save. Niagara-on-the-Lake has lots of great experiences for you to discover, book your stay today at one of our beautiful bed and breakfast’s, inns or vacation rentals.